The decision to raise the issue forcefully in Parliament came on a day Congress vice-president Rahul Gandhi visited a bank branch on Parliament Street and attacked the government for the demonetisation move. The Parliament’s winter session is set to have a stormy start on November 16 with the opposition Congress on Friday giving a notice, seeking suspension of business on day one to discuss the demonitisation issue. Party sources said it planned to target PM Narendra Modi for “encroaching on RBI’ s domain”. “We will hold the Prime Minister to account. Under the RBI act, monetary policy is the strict domain of the RBI. The act is very clear. He has no business addressing the nation and doing this drama,” a senior Congress leader said. With several other opposition parties, including the Left, Trinamool Congress, BSP and SP, criticising the government for the sudden decision to withdraw Rs 500 and Rs 1,000 notes, sources in the Congress said it is in touch with others to ensure coordination on the House floor. 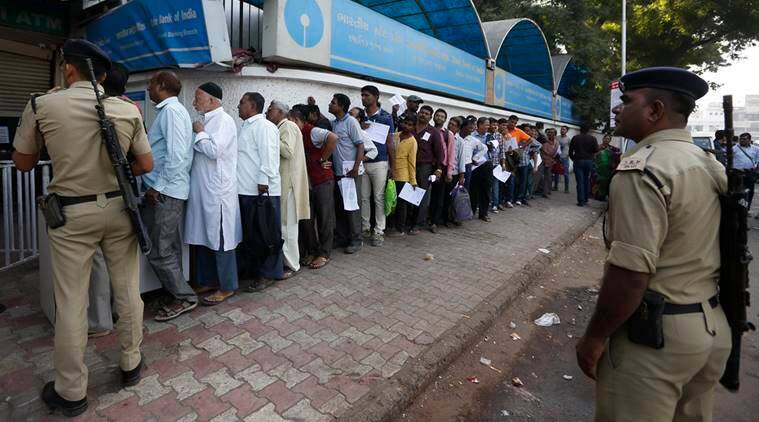 Rahul stood in a queue at the bank branch “to exchange Rs 4,000” and “be with the people” who are facing difficulties. “The poor are facing hardships. They have been standing in queues for hours and I have come to be with them. I have come here to exchange Rs 4,000,” he said. “There is no crorepati in the queue. Poor people are standing in queue for several hours. I want to say that the government should be for poor people and not for just 15-20 persons,” he said. At a press meet at AICC headquarters, senior Congress leader Anand Sharma further attacked the government, saying it had pushed the country into “financial chaos” and an “anarchy-like situation”. Sharma alleged that “some people” had prior knowledge of the move and asked the government to release the names of those who made investments of over Rs 5 lakh in gold, foreign exchange and bonds in the 20 days prior to the announcement. Hitting back at BJP chief Amit Shah, who attacked the Opposition for questioning the government’s move, he said the opposition cannot remain silent when such hardship is heaped on the people.